“My one job here is to create enough value. Hopefully, they’ll ask me to stick around and do some more work.” That was the statement conversation expert Rob Kendall made about during the early days of his career. Rob’s biggest challenge was the way he communicated with people. For his own self-development, he started to do some work that was focused on the whole area of communication. Soon after, he was already leading a lot of communication programs and was quite used to being in front of a room talking to 30 to 50 people every week. 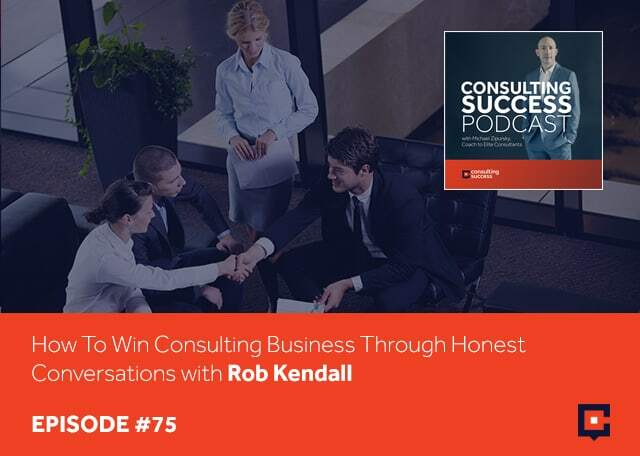 Rob shares his journey of learning the art and the skills of communication and gives some tips and insights on how to win in the consulting business game through honest conversations. His clients include AT&T, Burberry, American Express, British Gas, Lloyd’s, Shell, and Virgin. I’m excited to have Rob Kendall joining us. Rob, welcome. Thank you. It’s great to be with you. For those who aren’t familiar with your work, take a moment and share what you do. I am based and live in the UK. I work primarily with leaders who are facing complex, audacious or even impossible-looking challenges. That’s my idea of a good time and I’ve been fortunate to turn it into a career. Your clients include AT&T, Burberry, American Express, British Gas, Lloyd’s, Shell and Virgin. It’s an A to Z of many others. I want to explore how you got to where you are. Let’s start by looking at your early years. Before becoming a consultant, what were you doing? Why do you think that they invited you to join them? You studied communications but before that, you were an artist. What do you think they saw in you that you were able to bring to the table or add in terms of value that they wanted you to join them? At that point, I was already leading a lot of communication programs. I was quite used to being in front of a room. I would have 30 to 50 people every week or month that I would be in front of. I’d by that point developed that skill of being able to be in front of a room and unfold the conversation, not quite know where and how it was going to go. That didn’t happen overnight for me. That was over a period of years of trying to learn the art and the skills of communication. To challenge me as somebody who felt that didn’t grow up with any natural talent to be able to do that, do it well and do it professionally. I want to continue exploring the growth of your business and your professional career. What took you to fifteen different homes or locations in your first many years? My dad was in the military and he wanted to take all of the far-out postings. We lived in Europe. We lived in the States. We lived in Asia. We lived in Africa. It was an amazing experience growing up to experience very different cultures, people of different faiths, different backgrounds. That was an amazing grounding for what I’ve ended up doing since then working all over the world, going back to many of those countries. When you came back to the UK, did you feel yourself, maybe even now, as a UK citizen? Did you feel more like an international citizen? People would always say to me, “Where do you come from?” and I was stuck. I was like, “I don’t know. Which one do I pick?” That was always a difficult question. I felt much more like an international citizen than somebody who came from one place. Part of that story was when I was eighteen, I went out and I worked in India. I worked with amputees who’d lost legs and arms. A lot of them worked on the railways or as lorry drivers. I remember going there my first day thinking, “What have I got to contribute to these people?” I come from a middle-class background in the UK. I can’t think of anything I can offer. I realized over a period of months that listening to them and their stories, being alongside them, being there for them that we developed these incredible friendships often using sign language and broken English. I learned more than anything the power and the art of listening. That’s probably the most important thing I’ve used of anything at all in my consulting career, is not going in and having answers and trying to pretend I’m a know-it-all. It’s being able to listen. You and I share probably more than either one of us knew coming into this conversation. I certainly didn’t spend time in fifteen countries in many years. At a young age, my parents took me from Toronto to Israel. My first few years and first language was Hebrew. I grew up in Israel surrounded by a lot of different religions, cultures and people and had a real appreciation for that. Coming back to Canada, next time in Vancouver, being surrounded by a lot of people from Asia. Initially, I felt like an outsider and I had a lot of challenges. I didn’t speak the language. I didn’t know anyone or get it. Looking back, that was such a gift. It’s made me who I am. As I’ve then gone and spent time in, for example, built a business in Japan years later and learning the Japanese language, what you’re saying about listening is critical. One thing that gave me a bit of an advantage in learning Japanese and being able to build a successful business there was listening. It wasn’t going in. It wasn’t talking and trying to say like, “I know what’s happening here and I can show you,” but rather listening. This one point of listening, if you embrace it and you become good at it can help you to grow your business probably more than any other tactic or strategy out there. It is a timeless principle. You’ve been called upon by this American consultancy. They wanted to bring you into a project. Would you consider that your real first client getting involved in consulting? Yes, it was a challenging time. They had these huge clients in the UK and then two weeks after I arrived, various things happen and the whole project closed. I was in the UK working for an American company that didn’t have any work in the UK. That was the start of my consulting career and for a while, I didn’t have any particular connections to call on. It was me cold-calling companies in the UK using the INSEAD yearbook. One of the directors of that company saying that she graduated in the same year as the people I was calling and saying, “Could I talk to them about consulting projects?” It was certainly a hard start to my consulting career. I learned that when I started my own business, I never wanted to do it that way. Break it down for us, Rob. What were you doing step-by-step? This was your first approach or first activity towards getting clients and building a business. What were you doing there? I was also working for this company elsewhere. I was working with them in the States more. When I was in the UK, I was cold-calling companies. I was saying, “This is who I am. I work for this organization. Could I talk to you about us working with you?” I would do a little bit of research on them. To be fair, one, I hated it. Secondly, the conversion rate was terrible. Did you get some business that way? At the time, I probably didn’t. The ratio of time and investment to work was pretty terrible. Maybe I was bad at it, but it was difficult. We were selling huge transformation reinvention programs and trying to do that by cold-calling was not the way to go. I then had a choice. Do I go out and live in the US with my young wife and young family or do I set up on my own? When I set up on my own, my commitment was to do it a different way. What did you do in those early days? What was the different way that you ultimately found to be more effective? I was working for a great company in the states, but as they grew and they grew rapidly. I used to sit in meetings with them talking about billable days and how many billable days we had to do a month. The main observation was that it was moving away from being in organizations to make a difference. It was so much more about turning the wheel of revenue and profit. When I started on my own, I said, “I’ve got one theme here,” and for me this has endured for the last many years that I’ve had my own company. I said, “It’s all going to be about partnerships for life.” That’s what I called it. It was about creating deep profound partnerships, working with people that I truly respected who were making a difference and who were taking on impossible challenges. I was fortunate my old company said, “We’ve got some other possible work in Europe,” and they let me do a bit of that where they had it. I got one client and I said, “My one job here is to create enough value. Hopefully, they ask me to stick around and do some more work.” That’s then how it’s built from one project to the next. You do great work. That client then continues to request your services and you continue to serve them. How does that one first project or one first client that you have established as your own turn into the next one? What were you actively doing? What did you find to be at that early stage most effective and generating more leads, more inquirie, and more opportunities? I was particularly lucky that my first big client was a company that was launching a new business. They said, “We want to invent a whole new world of online banking, online financial services.” It didn’t exist at that point. They then went on to build a billion-pound business in a few years. Being part of an organization that was growing and developing quickly that was full of bright, young, brilliant, like-minded people, to be right at the heart of that with a leadership team, I worked right away across that entire business for about several years and one that gave me an incredible grounding. As that business got bought and evolved and so on, those people went everywhere and scattered across the world. Sure enough, I would receive a telephone call saying, “I’ve pitched up somewhere else and could we have chat?” It got me the same challenge here and that happened for many years now. You’ve created these lifelong relationships, you and partnerships, as you’ve called it. You’ve focused on adding a lot of value. As some of those players, those people, the clients you had relationships with went to different organizations, they would call on you. That’s what brought you in and continues to bring you to different companies. At that early stage, you had this connection to this larger, more established US consultancy. For this bank or this financial institution launching this massive new endeavor, why do you think they called on you? They could have gone to a lot of other companies or a lot of other people or consultants. What do you think they saw in you that they wanted to bring you into their organization to help them to grow this? Often with these things, it starts with one small request. In their case, they had a young IT director. They had a huge challenge. They had to invent a technology that didn’t already exist to develop this business and they said, “Can you come in?” It was for a day or two. Work with the IT director and his team. It started there and as a product of that, he was a brilliant man. I worked with him over the next few years and then the finance director said, “I’ve heard about what’s going on over there. 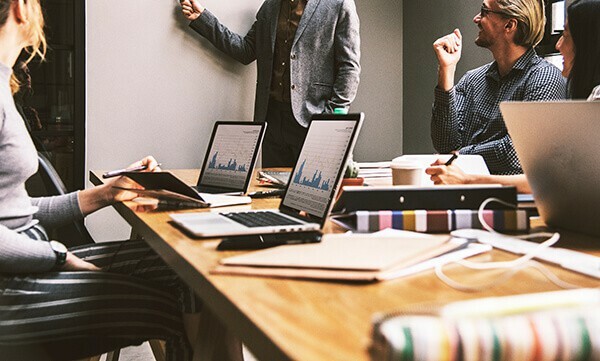 Why don’t you come over and work with my team?” From there, the chief executive said, “I want to get all of our top 50 or 100 people together and we want to invent the whole strategy for launch and the assumptions we’re going to work off and so on,” and then one thing led to another. The focus was always on providing value when what’s in front of me. Don’t get too far ahead of myself. Trust that if I provide value, then there will be more work. I don’t have to force anything. I don’t have to sell anything in. I’ve been lucky that I don’t feel any of the work I’ve done at any point I’ve had to particularly go in and sell myself. Hopefully, it’s from people saying, “I heard about other work that you’ve done. Could we have a chat?” Then it goes from there. You’re being humble in saying that you were lucky. Clearly, there was some intention here and confidence that you were bringing to the table. Looking back, it might be easier to say that you were focusing on value and that you trusted things would work out. 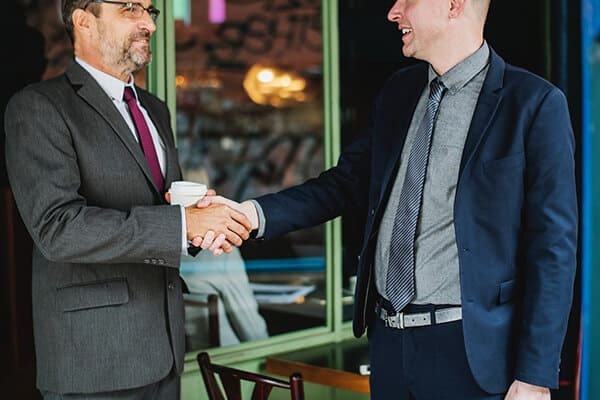 For a lot of people in our audience, they might agree like, “Focusing on value makes sense and creating lifelong partnerships make sense.” In those early stages or even for someone who has been building a consulting business for quite some time and they’ve maybe relied on referrals in their network. Things have gone well, but now all of a sudden it’s like the roller coaster drops. That referral well or their network has started to dry up and they’re looking for that next big piece of business. They’re looking for more leads and inquiries to come in. It’s hard at that time to trust that things will work out, where they have a long-term view of adding value and serving and hoping that will turn into a business. What gave you the confidence? What mindset did you have that allowed you to act that way and to believe that by adding value, business would come? Weren’t you concerned that maybe it wouldn’t come and maybe that you need to make more conscious or consistent offers to win business faster? What was going on in your mind at that time? If you go back to the beginning of the story, I’ve already spent my professional life exploring these skills and practices of effective communication. That is my core thing. I suppose one of the things I set out to do was to be really expert in that area. One of the things that have happened is in companies, organizations where they’ve had a particularly difficult challenge or problem that they’ve not been able to resolve. They’ve said, “We want somebody who can come in and help us do this.” If they’re saying, “We need to imagine the future and we need to invent what that looks like,” then they’ve caught on me to do it. For instance, if they had relationships that have been terrible, they brought me in to do that. Part of it for me has been about referrals and trust and so on. The other thing has been a relentless commitment to have an area which I could excel in. I spend my life researching, growing and developing. I still spend probably a few months a year trying to improve myself in my own skills and my research in that area. I spend quite a chunk of my year doing research work. I speak and write quite a lot. I’ve taken time out of the last few years to write a couple of books. Those have been an extraordinary process of development for me. What I love about my work and my job is every day it’s putting me out there in organizations with people in difficult situations often, in different parts of the world where it refines and develop my own skills and speaking and listening. A lot of that has been developing my skills on the job. If I look at what’s allowed me to be successful, one, I’ve been determined. I have always worked hard. Secondly, I have been committed to developing a set of skills where at least my aspiration is to match anybody working in that area. Thirdly, my aim at least always been to deliver more value than anyone else and also what I would hope is considered to be a reasonable fee, so that people want me to stick around. The other thing is this whole idea around relationship and partnership. If I’m not delivering value, then I will get out of there. I don’t want to be in an environment where I’m not making a difference. You’re right to challenge me because it’s easy to say now when I’ve been doing it for many years. In the early days, I must admit that did take a reasonable amount of courage and the reality of it isn’t always that easy. Your pricing and fees as demand for your services have increased and changed over the years. How has your pricing model and fees shifted if at all? I have increased them at certain points. They have changed and gone up over time. I do some more work now through other associates. I do some work more on a license fee basis. What I’ve always tried to keep my attention on are fees where people wouldn’t say, “Get him in and get him out as quickly as possible because it costs so much money.” A lot of the companies I’ve worked in, some of them I’ve worked in for several years. I hope that’s always been on the basis that people would feel that’s good value for money for us and therefore there’s always more work around. How do you approach your fees? Are you looking at the value that’s being created in the project and then basing it off of that? Are you looking at an hourly rate or the amount of time, daily fees or daily rates in terms of your involvement? What structure have you found to work best in your business? I tend to work on the basis of daily rates. That’s been always the main thing for me. As times gone on, as I’ve been able to develop offerings then there are other ways I found of being able to develop income. Some of it is through associates on other pieces of work and then some of it is now providing offerings that I can do on a license fee basis. When you say on a license fee basis, what does that look like and what are you referring to? I’ve been working at an airport and still work at an airport. They’ve been looking for something, a whole program and initiative that support people’s health, safety, and wellbeing. I’d been working with a brilliant psychologist over about a few years. Together we’ve developed a program that focuses on the nature of decision making and the nature of the brain and so on. 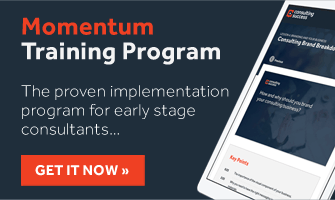 As part of that, we have trained a whole number of people in that organization so that they then are delivering a shortened version of that program across 3,000 or 4,000 people in that organization. We have a license fee arrangement that allows them to be able to do that. Do you consider yourself to be an independent consultant? I do. The thing that has been interesting is I’ve always had this choice around to what extent do I try and grow an organization, a big consulting company or not. I got clear early on what works for me, which is one of my main motivations in life is to have an experience of freedom. It’s that freedom to say, “I’m going to take a few months off and I’m going to write a book this year,” or to do work on a pro bono basis because I believe in what I’m doing, which I’ve done at various points. My view, my frame, I’m not saying it’s the right one, has been to develop an almost zero-cost business. I’ve got brilliant consultants who I trust entirely or associates I trust them entirely. I can pass on work to them. It gives me an enormous amount of flexibility. I earn as much as I want or need to, but then I have a lot of freedom to work when I want and as much as I want. When you’re working with those associates or passing them work, is that typically on a revenue share basis? You’re capturing a percentage of what they build so that you’re still earning even while they’re working? Are you simply referring business to them and that’s it? It’s the former. I earn from when they’re working. They have other businesses that they run so they’re not employees of mine. They’re not dependent on revenue from me. At the same time, they often welcome work and I’m happy to pass it on. It works for them and it works for the clients. It sounds like between working with associates, creating products or services that you’re now licensing. 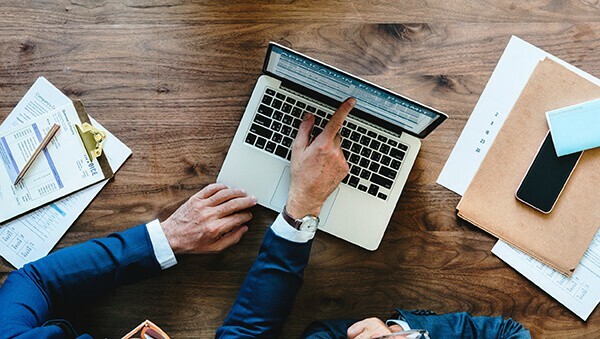 You’ve found ways to continue to scale and grow and benefit from leverage even though you are still running your business essentially as an independent consultant. It’s a choice that I’ve often seen consulting companies where people love the work they were doing with clients, but then ended up over a number of years managing the business and fell out of love with it. I got clear what I love is working directly with clients and the experience hopefully of being able to make a difference with them and being alongside them. I’ve constructed my business in a way that still allows me to do that. Hopefully, I can do it largely now at this stage on my own terms. In my experience and observation, there’s no right or wrong model or way to necessarily run a consulting business. It comes down to what each owner, consultant or entrepreneur wants to get out of it. Many people follow what they maybe see or hear others doing, even though it may not be the right model for them. It’s important to figure out what is meaningful for you. What do you want to create? To figure out what is the best model and path to support that and get you there. What would you say is maybe one of the biggest mistakes that you see consultants making that if they were to correct or to approach from a different way, they would get better results in their business and in their work? Let me give an example. I had a telephone call from an organization in the UK. They’re over 300 years old. They’re a household name and they said that they wanted to do some work with their executive leadership team. They said a consulting company came in and did some work with them. They said they were delighted with the work. They said it went really well. My question was, “Why haven’t you carried on?” They said the problem is this organization one, they said they had their model and they wanted to push their model. Secondly, they said they didn’t like the fact that they felt this company had this motive. Presumably, I was reading between the lines but they kept wanting to sell in the next piece of their work. That is the biggest mistake. I’ve always taken the view that I’m not going to try and never going to try and sell the next piece of work. My only insistence with an organization is that we have no contract and that they can stop the work at any point. My deal with them is, “All I ask of you is that you pay me for the work that I’ve done end of.” One, it keeps me on my toes. Secondly, it leaves them always free and never feeling obliged to continue work with me. That’s almost the opposite of the situation I described where I’m constantly trying to bind them into the next piece of work. My view is I want you to always be free to choose me or not. That is often the biggest mistake. I’m in a situation where I don’t know whether I’ll end up doing that piece of work, but it’s on a completely different basis. When you say that you don’t use a contract, are you referring to there is no contract in terms of the length of the project that the organization, yourself are agreeing to? That you’re not using any form of agreement or contract when you’re doing business with clients? We might plan out a piece of work for a year, but I will work on the basis that if it isn’t delivering value for them they should stop it. They’re free to stop it at any point. You do have a written document that both parties sign? Nothing around confidentiality? Nothing around terms or fees or intellectual property? Usually, no. I might write them one document at the start that says, “This is the basis on which I’m working,” and there will be four or five lines in that saying, “The deal is you pay me for work that I’ve done. That you give me two weeks’ notice if you want to cancel work, but you can stop the work at any point.” That’s it. If they’re not getting value then they shouldn’t have me there. If it’s not working for me then I should get out. That’s the arrangement. 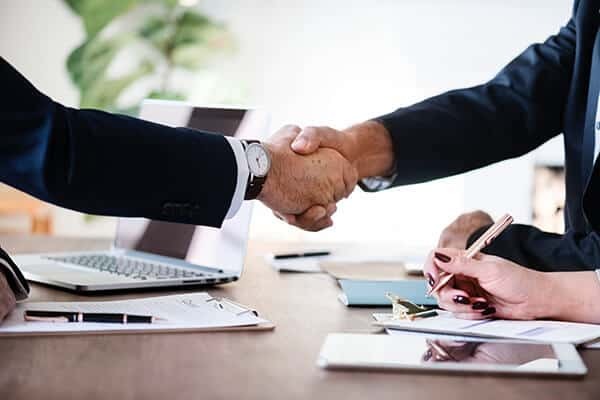 Is any of your work going through procurement departments or is it all coming from direct agreement and signing of a check by the ultimate decision maker, the CEO, or the executive leader? It’s easy to work with the leader. Maybe I should slightly correct what I said. Sometimes for pieces of work, they’ll say we need to agree on a purchase order. We need to do that through procurement. We will agree on a purchase order, but nothing more than that. There’s no further documentation. There might be talking about the licensing arrangement. I have a couple of times said, “Let’s draw up a simple licensing agreement.” My point on this is important. It’s a relationship of trust. That’s what I’m doing there and that’s what we’re signing up to. A relationship of trust says, “We’re going to stay in communication. If it doesn’t work at any point, then that’s something we’re going to talk about.” I don’t want anyone feeling obligated to keep me hanging around. I’m not going to stay there for the sake of it because it’s bringing in money. If I don’t think it’s making a difference, then I’ll stop the work. I’ll address that and I’ll go and work somewhere else. This was such great insight and experience that you’re sharing here. For many, they’ll be seeing things in a different light. Not too often do we hear about consultants running their business in this manner and clearly, it’s worked well for you. We have a couple of questions for you. What book are you currently reading or have you enjoyed reading? This fantastic book called Subliminal and another book called Incognito. What I’m studying is the nature of decision making and particularly then how that shapes the way that we speak and listen. Hopefully, that’s preparation for another writing project before too long. That’s in my plans. The other thing I want to make sure about here is that people can learn more about you and your work. Where’s the best place for them to go to do that? They can go to my website, ConversationExpert.com or I would love people to read my books. I’ve had two books that have been published in the last few years. The first book is Blamestorming that’s out in five languages. The second one is Workstorming, which is more about communication in the workplace. I also write blogs for Psychology Today. I’d love people to read anything I’ve written and give me some feedback. I’ll definitely be checking on those books as well and diving deeper into your work. Rob, I want to thank you so much for coming on. I enjoyed this conversation learning about and hearing your story and some of the things that we share. The approaches you’ve taken, some are different but have worked well. I do appreciate that. Thanks very much. It’s been great to speak to you, Michael.